The Yamaha FJR1300A and FJR1300AE/AS are sport touring motorcycles made by Yamaha Motor Company. Both models have a 1,298 cc inline-four engine. The AE/AS model has an electronically controlled clutch and gear shifting system called YCC-S. The clutch and transmissions of the AE/AS models are identical to that of the standard FJR model. The FJR1300 was introduced to Europe in 2001, before arriving in North America in 2002, with the 2003 model year designation, and offered in a non-ABS version only. The 2003 model garnered several awards in the Sport Touring category from various magazines. The 2004 North American models included both a non-ABS version with traditional blue anodized brake calipers and a new ABS version. Other refinements included an upgrade to the suspension rates, 320 mm front brake discs (was 298 mm), and a fairing pocket for small items. The 2005, North American model year remained structurally unchanged with a non-ABS and ABS model. In 2006, the U.S. and rest of the world model years synchronized with the introduction of what has become known as the 'Gen-II' version of the machine. The design changes included significant trailing arm changes, revised final drive ratio, a curved radiator exhibiting a larger surface area, instrumentation changes, an upgraded alternator and significant attention to airflow changes to deal with reported heat issues in previous years. Yamaha added adjustable vents to the FJR1300, allowing the rider to direct air closer to or away from the body. Starting with the 2006 models Anti-Lock Brakes (ABS) and a linked braking scheme Yamaha calls 'Unified Braking System' (UBS) became standard. 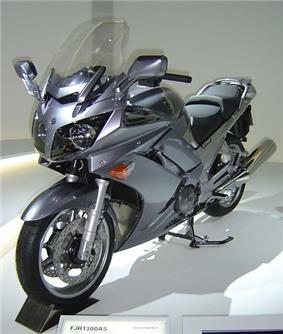 Also, the FJR1300AS model (FJR1300AE in U.S.A. and Canada) was introduced which had a semi-automatic transmission. The AE variant was discontinued for 2010, although the AS model continued to be sold in markets outside of the USA and Canada. For 2007, some very minor changes were made to the ECU to deal with potential issues related to altitude changes under certain circumstances. In 2008 changes were made to throttle 'feel', to improve low speed on/off throttle transitions. As well Yamaha changed suppliers for the ABS system. Further refinements in the throttle control were introduced with the 2009 model. For 2012 the previously optional heated hand grips became standard. 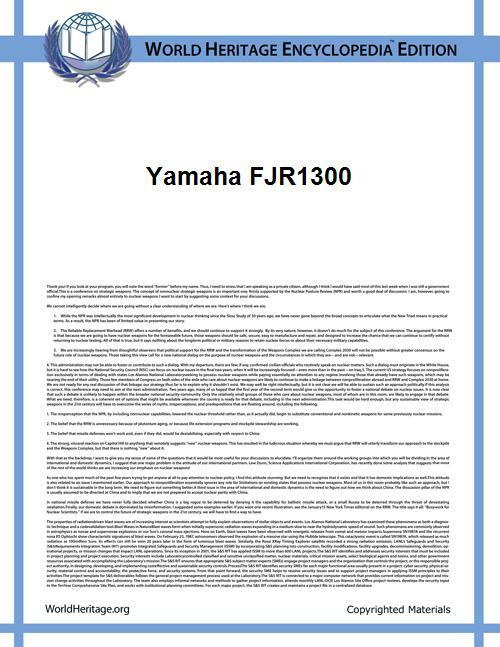 For 2013 the FJR1300 received a substantial number of updates, becoming the 'Gen-III' version. Bodywork is all new on the front half of the bike for better airflow and engine heat management, and a new faster-acting windshield mechanism was introduced. Front turn signal/position lights are now LEDs and there are LED accent lights around the headlights, and there is now one horn instead of two on prior years. In markets outside the US and Canada the AS (AutoShift) model received electrically adjustable suspension and inverted front forks - those suspension changes were introduced into the North American models in the following year as a model option known as the 'ES'. The dash is also revised and now includes three user-customizable informational pages that allow the rider to select what information is displayed on each page, from the following list: Odometer, Trip 1, Trip 2, Coolant Temperature, Air Temperature, Range (to empty), Average MPG, Current MPG, Timer 1. There are two other timers and two other distance meters for tracking maintenance intervals which can be reset, but not displayed on the information pages. Mechanically, the engine now has plated-on (rather than pressed in) cylinder linings for better heat dissipation. The ECU is new and now employs Yamaha Chip Controlled Throttle (YCCT) system, which is a ride-by-wire system. The implementation on the FJR1300 includes 'D-Mode', which incorporates two driving modes, 'Sport' and 'Touring', the primary difference being smoothness of throttle response. In addition to that, the new ECU incorporates as standard features an integrated Traction Control System (TCS) which can be disabled, and Cruise Control. In addition to new controls for D-Mode and cruise control, several controls are different. There's a new rocker on the left hand grip that controls the heated grips and which page is displayed on the information panel; which function the rocker provides is controlled by a trigger switch near the left forefinger. The stop/run rocker is now stop/run/start with the last position being momentary; the hazard flasher button is where the starter button was previously located. A similar rocker switch for headlight control provides high/low/flash controls. In 2014 the FJR1300 split off into two models: the FJR1300A and the FJR1300ES. The FJR1300A is nearly identical to the 2013 model, however the cruise control programming was changed to raise the maximum set-speed from 83MPH to 100MPH. The FJR1300ES included this update as well, but more notably adds inverted forks and electronically adjustable suspension. The suspension on the ES model can be adjusted via the menu system built into the gauge cluster. The front forks have adjustable damping, with three main settings (Soft, Standard, Hard) and seven adjustments (-3, -2, -1, 0, 1, 2, 3) within each level for fine-tuning. The rear shock has electronically adjustable preload, with four settings (Solo, Solo with luggage, Two riders, Two riders with luggage). While the damping can be adjusted on the fly, the preload can only be changed while stopped. The FJR1300 has a 1,298 cc (79.2 cu in) transverse-mounted inline-four engine with four valves per cylinder. The FJR1300 uses a five-speed manual gearbox with wide ratio gears. Final drive is via shaft, encased within the swingarm, which has monoshock suspension with remote quick-set two position adjustable pre-load. The FJR1300AE/AS model features an electronic clutch, which Yamaha calls YCC-S. There is no clutch lever on this model. Instead, the YCC-S system allows the rider to shift using a set of manually operated push buttons on the left handlebar or via the standard gear shift lever. The electronic clutch is controlled by an internal computer, allowing gear shifts to complete in approximately 0.2 seconds. The gearbox pattern is also unconventional in that neutral is at the bottom end of the range, otherwise the gearbox is identical to the A model. The ECU automatically controls the electronic clutch and ignition timing to ensure smooth gear shifting and will actuate the clutch at standstill. Stalling the engine is not normally possible. The motorcycle frame of the FJR1300 is a twin spar design manufactured from aluminum alloy; the engine is a fully stressed member. The FJR1300 features a standard 12 volt, negative ground electrical system. The 2006 and later models feature a fused, switched cigarette-lighter style accessory jack in the left central locking glovebox. The 2003 U.S. model does not have a glovebox or electrical outlet; while model years 2004 and 2005 have glove boxes, they do not include the electrical outlet. As well, 2006 and later models have larger alternators and so can support more electrical accessories than their predecessors. The FJR1300 has an electrically adjusted windshield controlled by a rocker switch on the handlebars. In Gen I and Gen II models, by default the shield returns to its lowest position when the key is off, however some riders choose to disable the 'return' feature. In the Gen III model the windshield maintains its position until changed with the rocker switch, even when the ignition is turned off. A number of new features were added beginning with the 2006 model year, including a rider-adjustable airflow system. All Gen-II AE/AS models (and some A models, depending on year and market) feature standard integrated heated handlebar grips with speed sensitive adjustment (available as an aftermarket OEM kit for models not so equipped by the factory). The handlebars are position adjustable, with 3 settings, and the seat is adjustable to high or low, with about an inch between the two. Locking side panniers are supplied as standard in most markets and some markets include cloth 'liners' which can be used a carry-all for the contents of the cases. Each case will take a full face helmet. Factory options include foot protectors, hand guards, fairing protectors, larger wind screen, and a color-coordinated top box to name but a few. Many riders equip their bikes with a servo-operated cruise control system. There are several providers supplying the market. 2013-2015 models have cruise control standard. In Ireland and the UK, the FJR1300 has replaced the Honda ST1300 Pan-European as the patrol motorcycle with several police forces, following that model's withdrawal due to concerns over high speed handling. The FJR is the patrol vehicle used by the police force of Trinidad and Tobago including the units in the convoy of the President and the Prime Minister. It is also used as the standard patrol motorcycle of the Royal Netherlands Marechaussee. 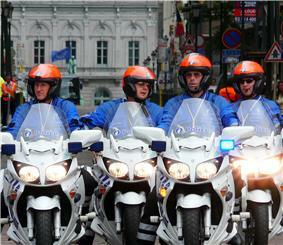 The Danish, French and Australian Federal Police also use the FJR1300. ^ Yamaha YCC-S Electric Gear-shifting System Yamaha Motor Corporation, U.S.A.